I love this book! Mindless Eating: Why We Eat More Than We Think has been a subject of more than one blog over the past few months. Some of the things I’ve read are not news, but the fact they have research to back them up somehow makes the information more fun. First off, there is the see-food response you may be aware of. It is very simple: you want to eat the food you see. “Hunger” never enters the equation. So, if you don’t want to eat (or overeat, really) then you need to make the food less visible to you. They tested this one out by giving secretaries (the book says “secretaries” but I thought we had all shifted to “administrative assistants” years ago?) a candy dish on Secretary’s Day (sticking with the vocabulary in the book) filled with 30 Hershey’s Kisses. Half the secretaries received a clear candy dish and half of them received a white dish. The secretaries with the clear dishes attacked the candy 71% more often than those with the white dishes. This translated into them eating 77 more calories every day! (Over a year this would have added more than five pounds of body weight!) The scary thing is, they probably didn’t even realize what they were doing. Doesn’t it make you want to cover all of your clear bowls and dishes? And then there was the second part, that boils down to the fact we are all lazy people; we don’t want to have to work too hard for our food. Using the same setup with candy dishes at the (different) office, this time the scientists used clear dishes with lids and varied where they placed the dish. They placed the dishes one of three places: on the desk, in the desk, and six feet away from the desk. Those with the dish on their desk within eyesight had an average of nine kisses (225 calories). If they had to look inside their desk and open a drawer, they only had an average of six kisses (150 calories). If they had to walk six feet to reach a candy they only ate four (100 calories). They had to think about whether it was worth the effort and time to stand up and reach for a candy. Those split seconds of thought were all it took for the secretaries to slow down their consumption. So if you know in your heart that you don’t want to eat all of those Girl Scout Cookies you just bought (they are cute and it’s such a good program), for heaven’s sake put them out of reach. I put mine in our freezer and we still have boxes left from last year! Make consuming impulse foods like candy or cookies less impulsive… make yourself take a trip around your house to access them if you can’t get them out of your brain. Those little tricks can make a BIG difference. I kind of structure my life so that I am an open book. It just seems easier that way. When it comes to my diabetes, I am the same way. Sure, that means I end up answering some of the same questions a lot, and it isn’t always the most convenient time for me to take a moment and explain something, but I would much rather be an open book than have others question my disease in silence. I’m certainly not quiet about my diabetes at the law office. I check all the time (I swear; all the time!) at work and eat often. It’s a small and friendly office, so I’ve been discussing my diabetes there for years. But yesterday I learned something new. I learned that my friends perceive me and my diabetes a lot differently than I perceive myself and my disease. We were discussing a friend of a friend who also has diabetes and had experienced two separate low blood sugars (can you believe after 23 years I still have to think about “is that hyp-O or hyp-ER”) and lost consciousness. I tried to explain to my friends how a sudden low blood sugar can happen, how it is not at all the person’s “fault” and how, perhaps hypocritically, I think probably an insulin change may not be the only thing that this person needs in order to be re-awarded a driver’s license. And then one of my friends said to me that she was glad I never need to worry about that happening to me. And I literally heard my brain process that comment. Its response was: KA-THUD. It was interesting that she thought that because I check my blood sugar and wear a pump and CGM that I somehow am not at risk of a low that blindsides me to the point I need medical attention. I logically understand this is a great perception and one I want to encourage in others, that I don’t let having diabetes prevent me from taking charge in my life. I think it just felt odd to me to see how truly my friend believes that to be true. I also know that there are times when I need help from others when it comes to a low or even a high blood sugar. I don’t consider any of this—any need for help I may have at any given moment—a drawback in my life. I don’t consider needing help a weakness in the slightest. In fact, I think it’s really great that I DO have people in my life who CAN and WILL help… even those people who I have never met. And I assure you, I know that I do need that help. I need to know it’s there when I don’t physically need help, and I need to call on it when necessary. And knowing that makes me feel luckier than nearly anything else. Corny, I know, and maybe I’m just trying to kiss up to it, but my favorite muscle is my heart. First off, I love that I never ever think about flexing my heart muscle, or showing it off to anyone. It looks the same whether it is wearing a nice shirt or a bathrobe. My heart doesn’t care about looks, and for that alone, I love it. The second reason my heart is my favorite muscle is that it is always the first to respond to whatever training I put myself through, over time. My bicep has taken eons to show itself in comparison to the strength of my heart, which I demonstrate every time it beats. I also love my heart because even though I never ever ever give it a break and it should really resent me for that, it still keeps working every minute of every day. Even when I sleep my heart is taking care of me, and is even ready to beat faster if I have a nightmare. No questions asked. In return, I try to make things easy for my favorite muscle. When your heart becomes stronger and larger it can push out more blood with each beat, so it doesn’t have to work so hard. If your heart pumps about 70 milliliters of blood per beat, and your heart rate is 70 beats per minute, you pump 4,900 milliliters of blood in a minute. After exercising for a while your heart improves, and can pump maybe 80 milliliters with each beat. To pump the same 4,900 milliliters per minute, it need beat only about 61 times per minute. It is not unusual for aerobically fit recreational athletes to have resting pulse rates in the 50s, or even in the 40s. I work hard to appreciate my heart. One of my favorite ways to appreciate my heart is to train it to work a lot harder so that it can do less work the rest of the time. Treadmill Tuesdays are one of my heart’s favorite times: interval sprints on the treadmill at the treadmill’s maximum speed would not be possible if my heart didn’t work as hard, and as well, as it does. It’s a pretty cool muscle, that heart of mine. I think I’ll keep hold of it for a while. Fresh Start? First of the Month? On Monday? How about TODAY. A fresh new notebook at the start of school has that same special quality of newness: the book is clean, no bent corners, no scuffed edges, just a sea of possibilities unmarred by reality. Now think about that same notebook at the end of the school year. It spent several months smashed into a bag and lofted across the room. It probably has some chocolate smears on some of the pages (and a few blood smears if you check like I do) and you may just be so sick of the subject you wrote inside that you want to never ever see it again. Do you even know where it is anymore? Knowing that we repeat this excitement and disappointment undulation with most of our goals can cause us to procrastinate making a positive change. I just worry that we make the process seem bigger than it is when we anticipate starting fresh. As we see it looming, our anxiety levels increase. We know we have disappointed ourselves in the past and we fear we will do so again. See, here’s the thing: your body doesn’t know what calendar day it is. It doesn’t know that you are wearing a new outfit or that your cupboards may have some junk food in them. Your body only knows what you are doing right this minute to take care of it. And right this minute, you can do something different. You don’t have to wait! You can break the cycle of anticipation and disappointment, and you can banish feelings of failure, just by changing how you begin the process. If you make beginning a New Thing less of a Big Deal and more of a subtle shift in priorities, you may just be able to make some Big Changes without a lot of unnecessary stress. I met Carrie Cheadle in 1998 while working together at Bearskin Meadow Camp. Carrie is a Sport and Exercise Mental Skills Coach and has worked with Diabetes Training Camp. She knows what’s going on inside our brains… and if she doesn’t know, she knows what questions to ask to probe for an answer. She may not have diabetes herself, but she has spent a lot of time working with people who do have diabetes and she knows a heck of a lot more than the average Jane. As Spring comes around this year and the weather (most assuredly will) turns more welcoming, I invite everyone to recognize how much your experiences have taught you and let go of your fears just a little bit. Go after an opportunity you’ve been considering. If you’ve read any of my previous posts you may have noticed that I like to observe themes that come up for me or my athletes and then write about how they tie into the psychology of sport and athletic performance. My most recent experience of this occurred when I was presented with an opportunity that had a fast approaching deadline and I had to decide relatively quickly whether or not I should go for it. In sport, if you have a gut reaction and you hesitate, the opportunity is gone. There is a time for calculated decision making and a time to listen to your instincts. So why do we hesitate? Why do we sometimes hold ourselves back from seizing an opportunity? Often athletes hold back because they aren’t sure if listening to their gut will lead them to making the right decision. The thought process goes as follows: what if I go for it and I’m wrong? The other dynamic I have observed is that athletes might hold back if they have stumbled onto new territory. They don’t trust their gut because they have never been in that situation before. If any of you have heard me speak, then you have probably heard me say that our ability to learn is directly related to the feedback that we receive. There are many ways for us to receive feedback and one of them is through the mistakes that we make. Mistakes help us refine our skill. If you never risk making mistakes you’ll never perform to your potential. You have to push through the walls that hold you in your comfort zone in order to reach the next level. If in the midst of competition you are weighing out the options before you and just aren’t sure if you should listen to your gut, that means you are up in your head analyzing and by the time you get out of your head, the moment is gone or the options have changed. When you have that feeling in your gut that tells you that an opportunity might be presenting itself, that instinct doesn’t come out of nowhere. You have read into some external cue and your brain has quickly run through your past memories and experiences and presents you with a feeling in your gut to let you know that something’s up. During a race or a game, you don’t have time to weigh out the pros and cons of a decision. If you are a novice in your sport, you might not know the right thing to do in that situation so you pause and question yourself. Athletes who over-analyze the situation will hesitate and miss the opportunity. As you gain more experience in your sport, you will start trusting your instincts. Elite athletes with more competitive experience are more likely to tune out irrelevant distractions and go with their gut. If we didn’t have the capacity for a gut reaction, we would weigh out the pros and cons forever and never be able to take action. The fact is you may one day seize an opportunity and watch it fail miserably, but as an athlete, being able to trust and listen to your instincts is something you have to be prepared to do. The other aspect to consider is that we are simply out of practice when it comes to listening to and trusting our instincts. In fact, when we hold ourselves back, we are practicing not listening to our instincts. Some of the greatest moments I have had working with athletes have come from listening to my gut. I get a feeling about a question I need to ask or a homework assignment to give. I might hesitate for a moment and think, “What if I’m wrong about this?” – but then I trust my gut and go for it and it turns out to be the exact question that needed to be asked or the exact assignment that needed to be done in order for that athlete to move forward. Of course sometimes I go for it and it wasn’t the golden moment I thought it would be and I say to myself, “Well that didn’t work out”, and I just have to move on. So with my recent situation, I seized the opportunity. Maybe it pans out and maybe it doesn’t – but it definitely wouldn’t pan out if I didn’t seize it. When you seize the opportunity, at least you have given yourself a chance for it to be great. Sometimes you just have to take the leap and see where you land. I’m going to be making some changes to my website this weekend to better explain what I do and what you can expect from me. Keep checking here (blog.diabetesoutside.com), Facebook (www.facebook.com/diabetesoutside), and Twitter (@diabetesoutside) for updates!! Needles: What More Can I Say? I wanted to spend the week blogging about needles and diabetes. Now that it’s Thursday I’m feeling like I’ve run out of things to say. I mean really: as a type one diabetic I need to inject insulin to stay healthy (and alive) and sometimes I don’t like that. Yup; that about sums it up. Many parents and I think not a few adults understand fear of needles when it comes to life with diabetes. I am fortunate to have gotten over any fear I had right away… I don’t enjoy shots, but I can’t say they have ever made me quake in my boots. But what about those who ARE terrified of needles? Of course those are the ones who need to explore other options for themselves beyond the traditional needle. 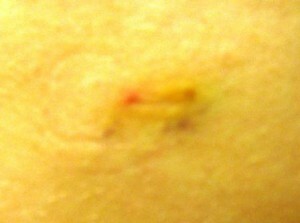 Although I should really have said on Monday: I’m really not a “jab and go” type one diabetic. I take my time with each shot and go slowly! I always have, and haven’t seen a need to go faster with my shots. I’m amazed (AMAZED) by people who can go fast. I always want to ask “what if you hit something?” but usually want to ask a millisecond before they inject and I am afraid of messing with their concentration at that point. I worry. Although the article discussing needle fear mentions people who are so afraid of needles that it can take them an hour to take a shot. An hour?! Yikes!!! I can think of about 3,219 better ways to spend an hour. No, more than 3,219 ways. A lot more. There is just so much there is to do in this world, and so much those of us living with diabetes specifically have to do every day I can’t imagine letting a fear of needles add any more time to my thoughts. I suggest that if you are struggling with needles and/or taking shots, make an appointment with your doctor to discuss other options for you. This, I repeat, is YOUR LIFE and YOUR DISEASE so don’t let someone emotionally bully you into doing something you aren’t comfortable with. If you need to speak with someone specifically about needle fear or anxiety, I’d say do it now rather than struggle longer than necessary. We know insulin is here to stay so let’s find ways to make it work FOR you instead of against you in your life or the life of your child. I know we’ve all had moments we look at our syringe and think “do I really have to do this? !” And shortly after asking the inevitable answer: yes: just do it. We know that the shots don’t always hurt. We know they don’t always bruise or bleed. We know these things, but that doesn’t really change anything. We know they won’t ever end, and that makes each one perhaps just a little bit gloomier. Although I have been on a pump for sixteen years, I still need a needle to set up my catheter. I still take shots when I’m high or when it is convenient to go without my pump for an hour or longer. No matter how I slice it, insulin cannot be absorbed in my stomach so I need to get it subcutaneously. I know that insulin injections have improved a thousand fold in the decades since they were first available as a treatment for type one diabetes. I think of the reused needles and the boiled syringes and shudder at the thought of the laboratory at camp established to sterilize and sharpen the syringes in the 1930s through 1970s. I see the insulin pens and insulin ports and little teensy needles on syringes marked with half units and smaller dosages and know that I am very fortunate. I marvel at what those who have gone before me and wonder what they would think of diabetes care now: I wonder if they would even recognize it! I will say: I don’t appreciate hitting something when I stick the needle in. I don’t appreciate the little divot that shows up in my thigh when I’m doing downward dog, made up of scar tissue caused by hundreds of shots in the same small area on my left thigh growing up. I don’t appreciate the state of California making it illegal to throw away a syringe. (Not that I have ever thrown a needle in a trash can; I use a clipper to cut off the needle or throw the entire syringe in a sharps.) I really don’t appreciate hitting something and pulling out the syringe to a spurt of blood, although I do appreciate being able to show a very impressive dark bruise to my husband. But, all in all, each of these complaints becomes so minor in the face of my other option. When I think of it that way, the needle gets a little shorter, a little sharper, and a little easier to manage. I read a blurb that sent me on a quick trip down memory lane the other day. Sigh. Back about 23 years to when I was first diagnosed, then to 1995 when I first went on the pump, and then my first years at camp (1998) and the first time I met a MiniMed rep my age. I used to use very long needles. Here I was, 10 years old and 58 pounds and I’m sticking a big ole needle in my leg. I cringe now when I reflect on it—thankfully it didn’t seem that big! Then I went on a pump and used the same kind of what now seems really long needle. It wasn’t until I went to work at Bearskin Meadow Camp that I even knew shorter needles existed! The same holds true for my infusion sets. The blurb I saw said that short needles can be used by any adults regardless of weight or gender, meaning they aren’t just for kids or those with a low BMI. Check it out! You may be like me and have to request your doctor change your prescription, but it might just be worth it. So skin is the same thickness no matter your girth. I guess I should review the Diabetes Forecast magazine more closely—it sometimes has something kinda cool. Reading the January 2011 Consumer Guide I saw this little gadget that is probably a great idea for some kids—it’s called the (cue sci-fi music) INSUFLON. It’s like a little insulin port—you stick a catheter in every three days and deliver insulin through the port instead of giving injections. Not as many shots/needles as syringes, not as accessible as a pump for little fingers. It may just be a great fit for some kids. Checking their web page, I of course saw something that raised a bit of a flag: they said that the INSUFLON was designed to help kids and their families come to terms with their diabetes. I don’t know about you, but the injections were and are not what I need to come to terms with when it comes to living with type one! Sure, it’s a critical and essential piece, but if that’s all you think you need to worry about, boy do you have a lot to learn. There are other “insulin ports” out there, but the INSUFLON goes in at a 20-45 degree angle, as opposed to the 90 degree angle required by the I-Port Injection Port. Not to mention the INSUFLON has much better sound effects when you use its cool name.